France is sending its largest warship to join operations against Islamic State (IS) in Syria and Iraq. Its involvement in the campaign will shorten the time it takes for French jets to carry out air strikes. France has been targeting IS in Iraq as part of the US-led coalition since September 2014. In September this year French forces began air strikes in Syria. 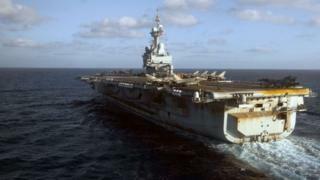 The Charles de Gaulle aircraft carrier has already been deployed against IS. The ship - France's only such vessel - was used as a base for French jets in the Gulf from February to April. France is currently using six Mirage jets stationed in Jordan and six Rafale jets in the United Arab Emirates to target IS. The aircraft carrier can hold up to 40 aircraft and support 100 flights a day. Islamic State: Who is doing what? The French President, Francois Hollande, described the deployment as "a rational choice" which would "allow us to be more efficient in coordination with our allies". French officials have described the air strikes on IS as self defence, after Islamist gunmen killed 17 people in twin attacks in Paris at the start of the year. Since that time, French fighter jets have carried out 271 strikes in 1,285 aerial missions across Iraq, according to the AFP news agency. Only two known strikes have been carried out by France in Syria, targeting an Islamic State training camp in the east of the country at the end of September. The Charles de Gaulle carrier is usually accompanied by several frigates, a refuelling ship and an attack submarine, according to Reuters.